I seemed to be missing a few of the edge pieces, and a trawl through the box only produced one piece, which was worrying. I stopped and looked at the whole puzzle, and found a section I'd put at the bottom left belonged on the top right. When I shifted them, I found that I'd set it out too wide. When I moved the sides closer together, it looked much better. Still need about 3 edge pieces, which are being very stubborn about remaining hidden. The very centre of the mosaic, is the only place that has green tiles, so any pieces with green had to go there; that helped pull the centre section together. Going for the cat outlines was a good idea, and I'm feeling more optimistic than I was a couple of days ago. 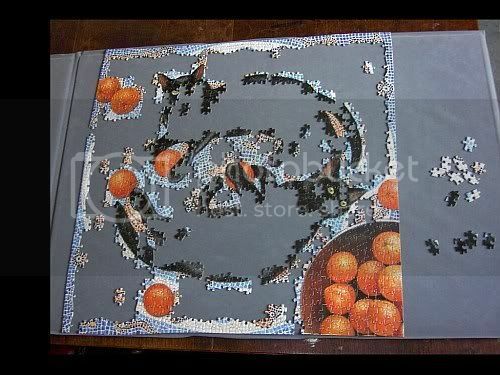 There's going to be some plain old hard slog, simply squinting at generic mosaic pieces and trying to match patterns. I keep telling myself it'll look lovely when it's done.